Watching HD MKV movies and TV shows on wide-screen iPad has been in vogue for a long time, mostly for its off-disc movie storage advantage thanks to the magnanimous support of multiple titles and tracks, subtitles, chapters. Extendedly, the video coding format H.265 stored in MKV is a breathtaking assist, greatly reducing the storage space of a file compared with that in H264. But you might be told that MKV won't play on iPad on Apple discussion forum. How to play MKV on iPad without problem? If you've downloaded MKV HEVC movies online and want to play MKV on iPad iPhone, check the steps below. 1. Convert among any SD and HD videos like MKV, AVCHD, MP4, MOV, M4V, MTS, M2TS, MOD, AVI, WMV, H.265, FLV, etc. 2. Laden with 410+ readymade profiles for latest mobiles, including iPhone X, iPad Pro, Samsung Galaxy S8, which converting MKV to iPad will be one click, without getting to know iPad parameter settings. 3. Support batch converting multiple MKV files at a time. 4. Deliver no.1 fast converting speed, thanks to the pioneer support of Intel QSV hardware encoding technology, reportedly 3-5x faster than any other famous video converter for Mac or Windows. 5. High-quality engine ensures to maximize the video transcoding, greatly retaining the output quality. Step 1: Free download the MKV to iPad converter on Mac. Windows users will turn to the Windows version and get it downloaded. Step 2: Go to Add Video button to load the MKV video to be converted. Or directly drag and drop the file into the window. Step 3: To play MKV on iPad without format issue, you need to go to the Device profile -> Apple Device -> to iPad video -> choose the specific iPad generation as per your needs. Or you can choose MP4 format at the general Mac video. Step 4: Click Browse to save the converted video and tap RUN button to begin converting MKV to iPad format. Then you can sync MKV to iPad with iTunes and then play MKV on iPad effortlessly. Step 1: After you free download the iPad manger on Mac, connect iPad to Mac with a USB cable. Open MacX MediaTrans and click "Video Manager", from the Add Video of which you can add MKV videos. 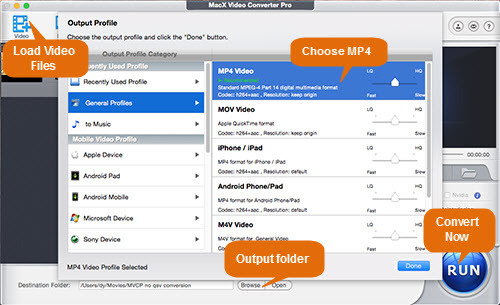 Step 2: Click Convert button if asked, which is meant to convert MKV to iPad supported MP4 format, and tap Sync button at the right bottom to begin MKV to iPad transferring process. After a few seconds, the MKV files will be put on iPad and then you can play MKV on iPad successfully. Note: MacX MediaTrans features the abilities to automatically shrink the file size up to 50% and rotate videos right way up to fit your iPad screen, so that you can store as many as MKV files on iPad without worrying about space woe and watch MKV on iPad with full screen. App store offers you quite a lot of apps that let you play MKV videos on iPad without any issues. Below we offer top 3 MKV players for iPad to suit your need. You can download VCL app for iOS 6.1 or later, which brings a great experience for iPad users to play videos like MKV, AVI or others. You don't need any other codecs to play MKV on iPad, if with the MKV player installed on iPad, Mac or other platform. It is a great video player working on iPad that allows you to play AVI, WMV, MP4, MKV, MPEG, M2TS, VOB, FLV, etc with Dolby digital plus surround sound. You can directly download MCPlayer and then add MKV file for limitless playback on iPad. This is a great free MKV player for iPad that can play a variety of formats, from MKV, AVI, to MP3, AAC. It is open source and free, working with many platforms, including iOS, Mac, Windows, etc.